Does Glo Brilliant Teeth Whitening Device Really Work? Is it really possible to get your teeth super white with home care? There are enough products on the market that claim that you can, so is the Glo Brilliant Teeth Whitening Device one that you can smile about? The Glo Brilliant Teeth Whitening Device is a revolutionary new way to whiten teeth without using the harsh peroxides that can sometimes cause people to experience discomfort or sensitivity on their teeth after treatment. The claim is that by using the Glo Brilliant Teeth Whitening Device you can whiten your teeth quickly and effortlessly without using the traditional methods that typically involve using the above mentioned peroxides and other harsh abrasives. The hype is realized by the cutting edge technology utilized in the Glo Brilliant Teeth Whitening Device which we will discuss further below. The cost of the Glo Brilliant Teeth Whitening is $264.00 Canadian at Sephora. This price includes everything you need to get started cleaning your teeth professionally and easily. As with any tooth whitening device or formula you have to be a least somewhat committed to using the device on a regular basis to achieve any results. The same holds true for any tooth whitening device or system such as the bleaches and other traditional tooth whitening systems. Now, the big question…does the Glo Brilliant Teeth Whitening Device work? Considering all the hype surrounding systems that use a blue light this one is getting really good press and reviews. The patented system is designed to whiten your teeth by up to five shades in as little 5 days of treatment. That alone would be enough to make you purchase thus unit but the fact that it will do even better with regular treatments. The best part of this unit and a major selling feature is that it performs the function it is intended without subjecting the user to the sensitivity issues that many encounter when using teeth whitening systems that primarily use peroxides or other harsh chemicals to get the same results. The unit is pretty simple as well; you set it up and then put the whitening gel on the teeth and then insert the mouthpiece and turn on the light and heat function which causes the gel to accelerate the process. The charging dock has a USB connector that easily and quickly charges the device so that it is ready whenever you are. The unit has a great reputation for doing exactly what it says it will do without the harsh abrasives and potentially sensitivity problems associated with the peroxides and other chemicals. The science behind the Glo Brilliant is very solid and there are great product reviews that indicate that most of the users are very happy with their purchase. 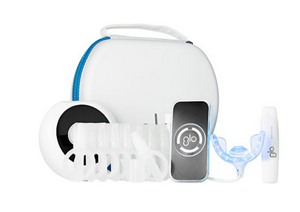 We are prepared to give the Glo Brilliant Teeth Whitening Device a thumbs up rating. For the reasons stated above we would recommend that anyone who wants to whiten their teeth and avoid the harsh chemicals try this Glo Brilliant Teeth Whitening Device or one similar. See if YOU get the smile you want! If you are looking for another approach to teeth whitening then you may want to take a look at Finishing Touch Smile Pen, as its getting some pretty positive reviews. What do you think? Does the Glo Brilliant Teeth Whitening Device work or not? Does Almighty Cleanse Really Work? Does Garnier Nutrisse Nourishing Hair Color Creme Really Work?